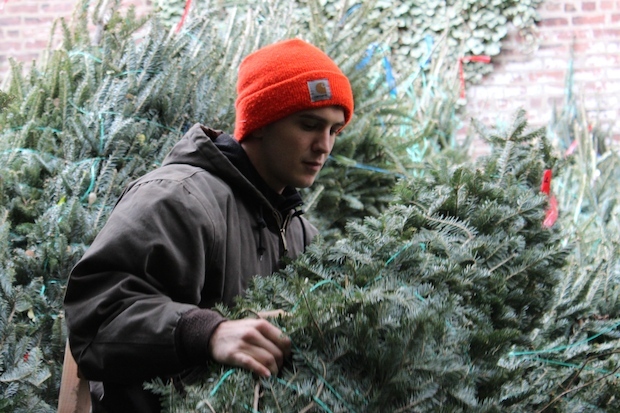 PROSPECT HEIGHTS — For two years in a row, Dan and Morgan Sevigny sold out of all 250 Christmas trees at their Prospect Heights tree stand and delivery service, Christmas Tree Brooklyn. So this year, the brother-and-sister team tripled everything, opening up two more stands, hiring two delivery guys and ordering three times as many trees from an evergreen dealer, they said. And when business started on Dec. 1, things got a little crazy. From 9 a.m. to 9 p.m., seven days a week, the siblings facilitate deliveries of trees to anywhere in the five boroughs — a service they offer for free — and oversee the operation of all three of their stands in Prospect Heights, Park Slope and Clinton Hill, which on weekends can get “pretty hectic,” Morgan, 31, said. “It’s definitely a labor of love. You’ve got to be excited about working a 12-hour day,” she said. Their season started the day after Thanksgiving this year when a flatbed truck delivered 750 premium, Quebec-raised Fraser firs to their stand at Underhill Avenue and Sterling Place, located in front of Pura Vida, the gym Morgan runs the other 11 months of the year. The Sevignys keep all the trees they’re not immediately selling in the gym's small backyard. The two Maine natives started the business in 2012 “on a whim,” according to Dan, after seeing tree sellers on Flatbush Avenue and thinking they could offer the same service. Besides, Dan was born on Christmas Day and they thought it'd be fun, he said. After cold-calling tree importers, someone finally agreed to sell to them. Three years later, they get orders from all over the city with customers buying trees as short as 4 feet (“table-top trees,” Morgan said) all the way up to 14-and-a-half feet — the largest size they have — at $12 a foot. Sometimes, they said, half their job is helping people figure out how tall their tree should be — like when a customer in Bay Ridge didn’t know quite how much room she had. The pair take turns hauling deliveries around in their “trusty sleigh,” Morgan said, a Honda SUV their mother loaned them for the month. In matching bright orange Carhartt work caps, they piled into the car one Monday afternoon with a 7-foot tree ordered from a home in Bedford-Stuyvesant. Customer Katie Helde was ready with candy cane decorations as Dan and Morgan carried the tree to her fourth-floor walk-up. Helde said she usually gets a small, portable tree she can haul herself, but was sold on something bigger this year when she heard about Christmas Tree Brooklyn’s free delivery. “It’s definitely more fun when it’s this big,” she said as she watched Dan and Morgan straighten the tree in its stand in her living room. Though the business is profitable temporarily (“for January, you’re all set,” Morgan put it, with a laugh), the siblings wouldn’t recommend anyone do the job “without your best friend and family,” Dan said. “We make money. I don’t know if it really justifies the time and how hard it is, but we get to hang out with each other and get to know the neighborhood,” he said. Christmas Tree Brooklyn stands are located at 184 Underhill Ave. in Prospect Heights, 84 St. Mark's Place in Park Slope and 256 Lafayette Ave. in Clinton Hill. For more information, visit the company’s website.